SILVER CITY, New Mexico, August 26, 2013 (ENS) – The U.S. Fish and Wildlife Service will propose increased recovery territory for Mexican gray wolves in Arizona and New Mexico and will drop plans to capture wolves entering these two states from Mexico, under two agreements reached today between the agency and the nonprofit Center for Biological Diversity. The agency has agreed to finalize a rule to allow direct release of captive Mexican gray wolves into New Mexico and to allow Mexican wolves to establish territories in an expanded area of the two states. One settlement was reached in a lawsuit challenging a permit the Service granted itself in November 2011 authorizing the trapping and indefinite incarceration of any wolves entering Arizona and New Mexico from Mexico. The Mexican government has been releasing endangered Mexican gray wolves a several miles south of the border, and these wolves could establish territories in the United States at any time. Under the agreement reached today, the Fish and Wildlife Service rescinded the permit and agreed that it lacks the authority to issue a permit to capture fully protected endangered gray wolves entering the United States from Mexico. “Our agreement provides important protection to endangered Mexican gray wolves by stopping this little-known government plan to capture wolves that enter Arizona and New Mexico from Mexico,” said Robinson. After years of delay, the Fish and Wildlife Service has proposed to change the rule to allow direct release of wolves into the Gila National Forest in New Mexico, where there is extensive habitat, and to expand the area where wolves are allowed to establish territories to include all of Arizona and New Mexico between Interstate 10 and Interstate 40. Under the agreement this rule will be finalized by January 12, 2015. The current rule requires that wolves from the captive pool can only be released in Arizona, and they are captured if they establish territories outside the current recovery area. Scientists and conservationists are objecting to the fact that the rule will still require capture of wolves that cross I-40 or I-10 from the recovery area. “We’re glad the Fish and Wildlife Service is finally making much needed changes to the Mexican wolf recovery program but these changes clearly don’t go far enough,” said Robinson. This summer, members of the Interagency Field Team documented denning behavior in nine Mexican wolf packs in the Blue Range Wolf Recovery Area. As of early June, at least 19 pups in five packs were documented. As the pups get older, the IFT will attempt to capture pups, administer vaccines, and affix pup size radio collars to monitor survival. The agency had hoped to have at least 100 Mexican gray wolves in the wild by 2006, but illegal shooting, captures in response to livestock conflicts and restrictions on where wolves can be released from captivity have blocked that goal. The permit, now rescinded, would have allowed for more captures to respond to wolf-livestock conflicts. Robinson says research shows such conflicts are better dealt with through changes in animal husbandry that reduce the likelihood that wolves and livestock will come into contact. 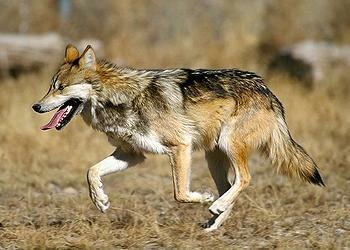 Gray wolves, a different subspecies, are also still at risk, conservationists argue. They warn that gray wolf recovery in the United States is not complete after hunters and trappers nearly wiped out the species. By the middle of the 20th century, few wolves existed in the Lower 48 states. Only several hundred gray wolves in Minnesota and an isolated population on Michigan’s Isle Royale remained, with a few red wolves and an occasional Mexican gray wolf reported. Both the Mexican gray wolf and the red wolf were eventually completely eliminated in the wild, and prior to recent reintroduction efforts, existed only in captivity. 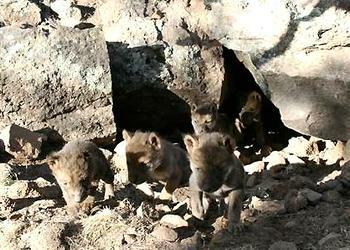 Gray wolves in the Lower 48 states now number about 5,000. Except for the Minnesota population of several thousand, all wolves in the Lower 48 states currently are listed as endangered under the Endangered Species Act. But in June, the Fish and Wildlife Service proposed to remove Endangered Species Act protection for most gray wolves across the United States, changing the future of gray wolf recovery and conservation. The Service will continue federal protection and expand recovery efforts for the Mexican wolf in the Southwest by proposing to designate the Mexican wolf as an endangered subspecies under the Endangered Species Act and to modify existing regulations governing this population. Outside of that recovery area, management and protection of wolves would be returned to state wildlife management agency professionals, following approved wolf management plans in states where wolves occur or are likely to occur in the future, the Service said. The two proposed delisting rules were published in the Federal Register on June 13, 2013. The Service welcomes public comment, which will be accepted through 11:59 p.m. on September 11, 2013. Guidance on how to provide comment is provided here. Please visit www.regulations.gov to view all Federal Register notices, and to submit an electronic comment.